December is a madhouse in my office. Our suppliers close down for the year a week before we do, and usually I spend every day working full time. 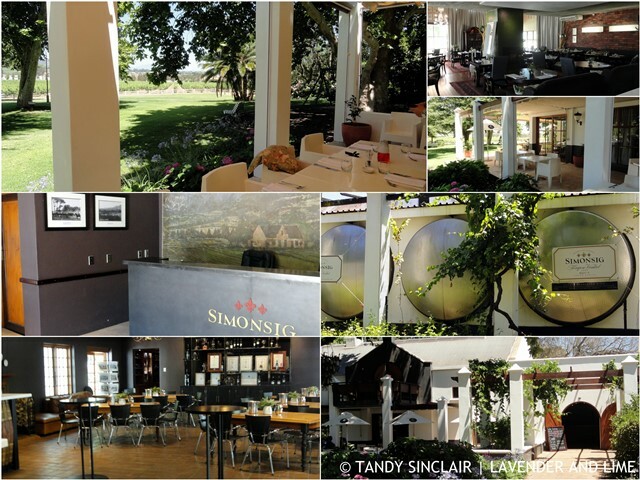 When I received the invitation to head to Simonsig Wine Estate to dine at the newly revamped Cuvée Restaurant, I could not say no. I decided it would be a time out for me from the rush and I am so glad that I went. Zomato have been extremely generous with their invitations and sadly I cannot say yes to each and every one of them. 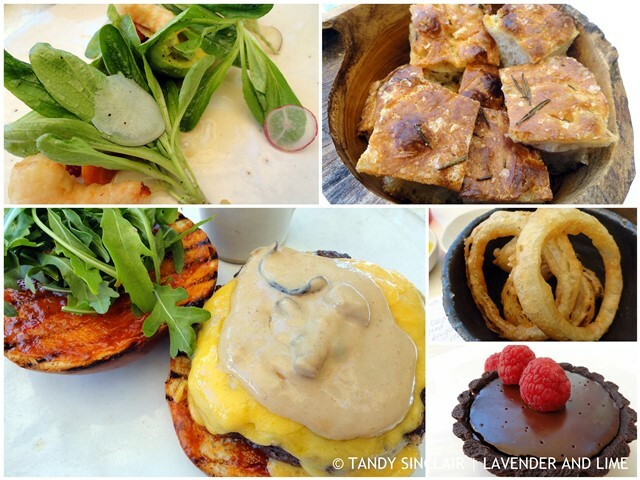 Dining in the winelands is an experience I am grateful to repeat on any and every occasion. I got there shortly before 11.30 am and as I arrived we were sat at the table overlooking the vineyards, with Table Mountain in the far distance. Our luncheon began with a glass of the Kaapse Vonkel Brut 2013 which was the first MCC to be made in South Africa. The restaurant has decided to move away from the fine dining concept and while still keeping their food upmarket, they are more family orientated. The dishes have been simplified and the restaurant decked in brighter colours. The new menu and wine list are a testament to the bright new look, with fantastic food photography showcased throughout. This has seen the introduction of cocktails using wine from the estate. 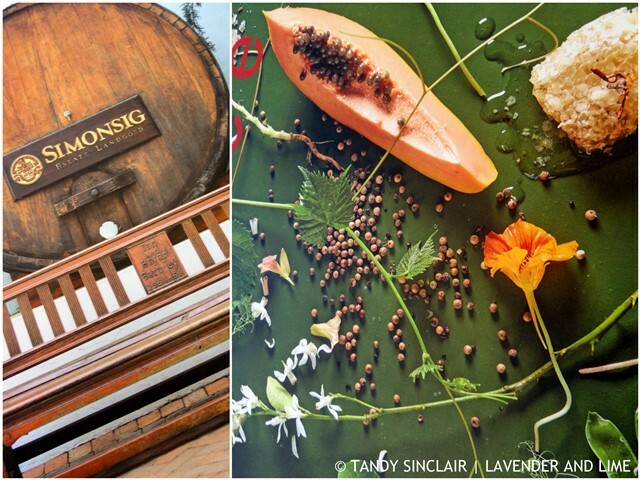 We were offered a choice of the Simonsig Kaapse Vonkel with fresh watermelon juice and a squeeze of lime. I tasted Jenny’s and it had a slight taste of the watermelon rind which I don’t like. 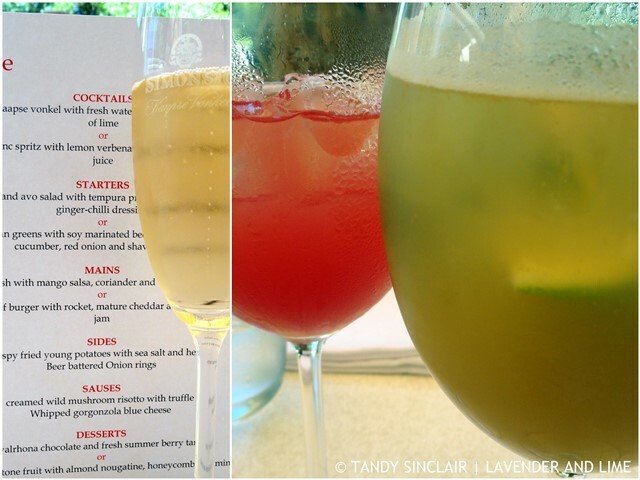 I chose the chenin blanc spritz with lemon verbena and freshly pressed apple juice which was really refreshing. We did a wine tasting with the lunch, and I made sure to get a sip of each wine, regardless of the meal I had ordered. For starters I chose the papaya and avo salad with tempura prawns, fresh radish and a ginger-chilli dressing that had a serious bite. I found the chenin blanc 2015 to be a perfect wine for the meal. The 2015 sunbird sauvignon blanc did not rock my boat as I found it too light. My main course was the Cuvée beef burger with rocket, mature cheddar and spicy tomato jam. Despite me ordering this medium rare, it came to the table rare. Not my favourite way to enjoy a burger, but the creamed wild mushroom risotto sauce with truffles made up for this. I ordered a side dish of beer battered onion rings that were scrumptious. The gewürztraminer 2015 served with the fish course was out of this world excellent and I also enjoyed Mr. Borio’s Shiraz 2012. This is a wine I shall remember for the next time we dine out and have an extensive choice of wines. My dessert of valrhona chocolate and summer berry tart was not a good one. I should have gone for the roasted stone fruit with almond nougatine, honeycomb and mint instead. I had two bites, ate the raspberries and left the rest. Disclosure: I was invited to attend this lunch by Jenny Coulson from Zomato. I was not asked to blog about the event. This post is in line with my blogging policy. I am on leave until the 11th of January. I will reply to comments on my posts when I can during the holidays. I wish all of you a very blessed festive season. May 2016 hold all your dreams. This place looks amazing. And the food just looks incredibly scrumptious. I am totally in love with those onion rings as well. These dishes and drinks look so delicious. Very fun day out and about. I hope you are having a super weekend! Sounds like a great restaurant! I’d love to try the salad with papaya and avocado! So much good food here in such a lovely environment, ah! Perfect place for dining and spending a weekend with friends and family. Your meal At Cuvée looks absolutely amazing! Mniam mniam! Thanks Agness, it was really good! What a beautiful place. 🙂 The cocktails look so refreshing!